The new God of War didn’t need downloadable content or multiplayer to remain interesting throughout its first month. It had patches, easter eggs and even a big social media controversy. God of War came out on Friday, April 20, same day as Nintendo Labo, but reviews started running a week earlier. Many, including ours, were positive. Critics loved these new adventures of Kratos, the angry Spartan warrior and Greek god, as he now stomped, paddled and axe-swung his way through parts of Norse mythology. For some, the enthusiasm for God of War was hard to control. Big gaming outlet IGN was so impressed with God of War that they made a joke on Instagram comparing PS4 having that game and Xbox having nothing. “Can you spot the difference?” whoever was writing copy for the outlet on social media asked. It is apparently offensive to needle Xbox like that, so thus followed a Tweet from a senior IGN editor describing the joke as “unprofessional and classless” and who apologized “to the Xbox team as well as the Xbox community”. Wow! Can’t joke about anything these days. The glowing reception God of War got from critics may have surprised a lot of series fans, since the game had earned skepticism (read: attracted haters) during its preview cycle thanks to its many apparent deviations from the status quo: a switch to a behind-the-back camera, a focus on father-son bonding, the removal of the combo meter, a general sense that someone decided to make God of War more emotionally sophisticated and that maybe that was the wrong way to go. Nope, reviewers said it was an instant classic and players seemed to dig it, too. The game’s glowing reception moved game director Cory Barlog to tears. His reaction was captured in a video he shot while checking on the game’s Metacritic score. He said he was proud of his team, but also noted that he wanted his son to see the video. “It has been important to us to let him know that it is OK to be sad,” he said. “It is OK to cry.” In discussing the game Barlog has talked a lot about how having emotions or showing weakness is a strength, a lesson Kratos and Atreus seem to learn from each other in the game. 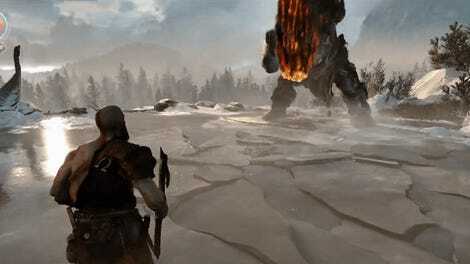 God of War players may not have teared up, but they probably squinted a lot. Somehow this game launched with very tiny on-screen text. Just two days after release, the developers patched the game to allow the text to be slightly bigger. They made the text bigger yet again with a patch in early May. DLC or not, in its first 11 days of release, God of War was patched eight times. That had to be a record and was seemingly a sign of some sort of troubles, but all we could discern was that “various bug fixes and improvements” were needed quite a few times. Thankfully, the patches were small and would install into the game swiftly. At some point, “Boy!” became a meme. Just a week after the game’s release, players found a secret tied to an official cloth map. Players also found an apparent Thanos reference in the game. 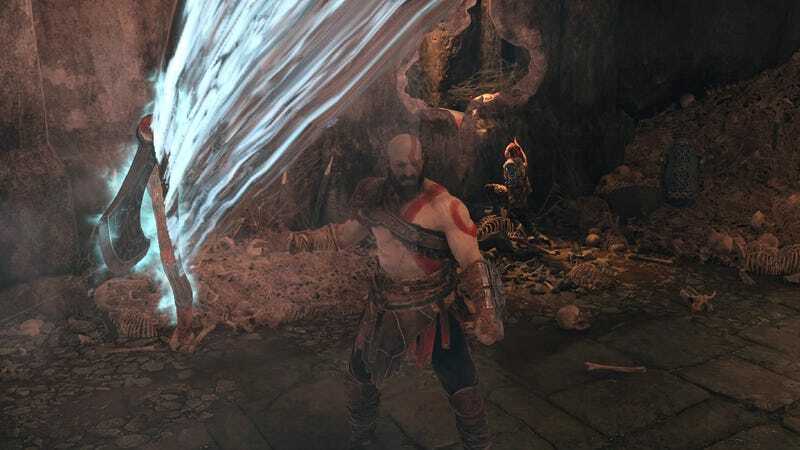 But Barlog has said that he hopes some of the secrets his team buried in this new God of War will take years to be found. By early May, the game got a photo mode. Players used it to make Kratos look goofy. Kratos voice actor Christopher Judge told some dad jokes. No apologies for these?? Sony boasted that the game was the fastest-selling PS4 exclusive ever. Aside from that? People were playing the game and writing thoughtfully about it. Not a bad first month!